This fictional memoir chronicles the lives of three men who join the US armed services and wind up together in Afghanistan. It follows them after they leave, coming home but not home, alienated, injured in various ways both tangible and intangible. It’s an important book to read, given the current state of affairs and the ways in which the government denies us information regarding the US war in Asia. Thank you to Edelweiss Above the Treeline and Houghton Mifflin Harcourt for the DRC. It will be available to the public at the beginning of June. Dax, Wintric, and Torres come from different parts of the country, but all are members of the American proletariat. Jobs and a future are not abundant in down-at-the-heels America, economically past its prime. Each of them comes to the service not out of a longing for glory or out of feverish patriotism, but pragmatically; where else can they find a job? Who else will train them, send them to school free? Most of their time in uniform is mind-numbingly dull. But it only takes a few minutes, perhaps even a few seconds to rock someone’s life and forever change it. All of them return, and no one is the same. Goolsby deserves credit for developing well crafted, if not necessarily likable, characters. The ambiguity as to some of their fates made me a little crazy at times, but that also demonstrates how much I was invested in the story. Interesting to me was the fact that I bonded a lot more with the women in their lives than with any of them. Yes, I am female, but I can’t count the number of male protagonists in other novels that I’ve bonded with. I think it comes down to culture; I have never been able to understand gun nuts (which is how at least one of them comes back), or with those who turn to violence as a necessary aspect of their domestic lives. And yet the story is written in such a way that it is entirely believable. Although I generally prefer urban settings in my fiction, I appreciated the way the writer cut across stereotypes of California by setting Wintric in the Northeast part of the state, a rural area near Chico. I think a lot of people who have not been to California, or who have flown into a major city and then back out, fail to appreciate how much of it is rural or wilderness. The character of Kristen as a girl who never wants to go further from home than the giant redwoods—doesn’t even need to get as far away as the Pacific Ocean!—was a brilliant stroke. 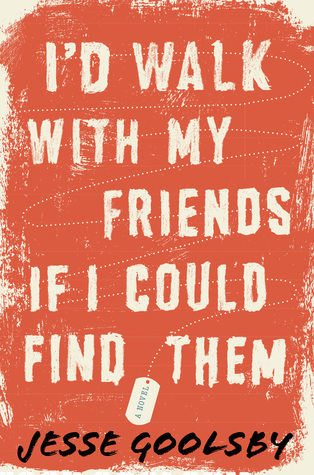 I’d Walk With My Friends If I Could Find Them is not a cheerful book or an uplifting one; if you are inclined toward depression and decide to read this timely novel, find a second book that is humorous or heartwarming to alternate with this one. But for those of us here at home who see no film footage of this war, no news articles that show what takes place on the ground or even the coffins that are sent home thanks to the governmental news blackout, it is an important addition. Thoughtfully written, and recommended. This entry was posted in fiction and tagged contemporary fiction, US war Afghanistan, veterans by seattlebookmama. Bookmark the permalink.